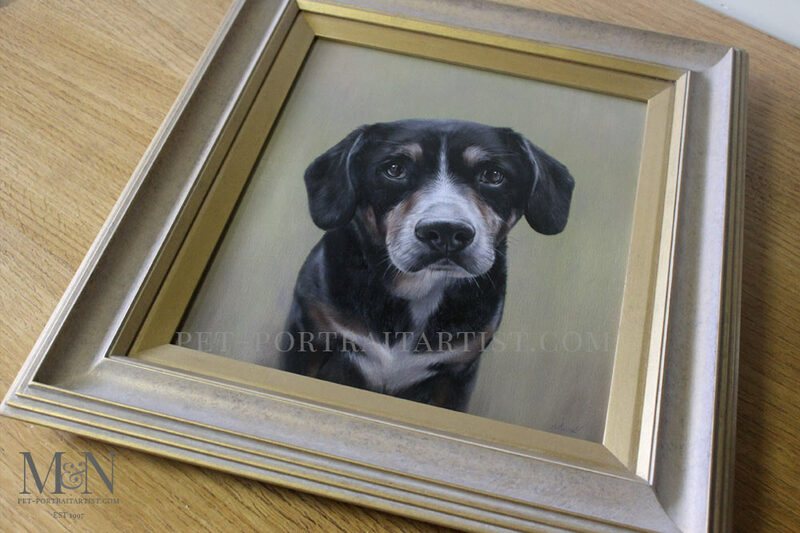 Welcome to the Pet Portrait of Lance an Entlebucher mountain dog! 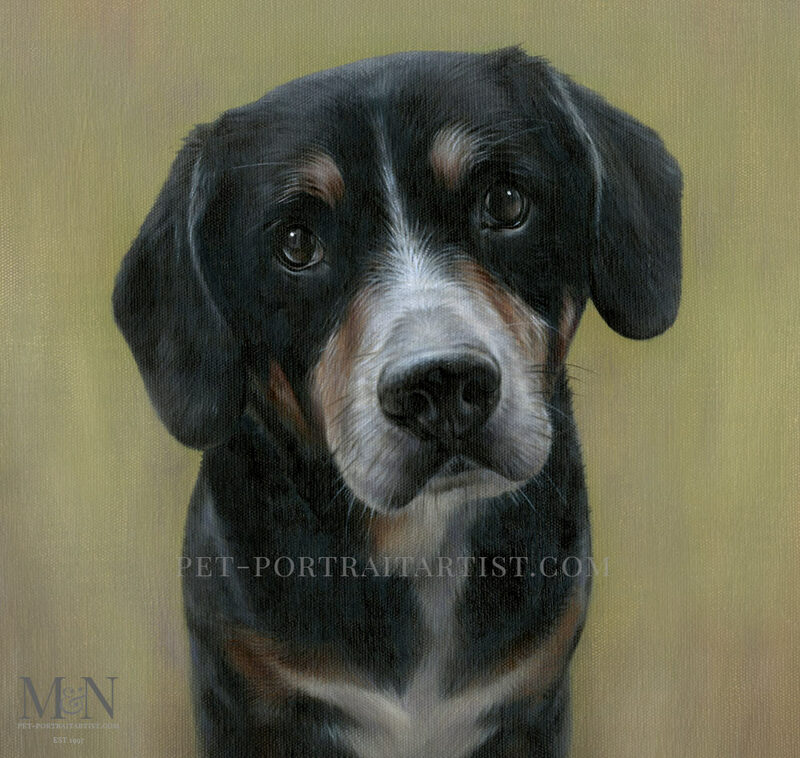 Jennifer contacted in 2017 and wanted to commission a painting of her partners dog Lance who is an Entlebucher mountain dog. Jenifer had a wonderful photo of Lance. He was sitting on their deck covered in sawdust after they had been cutting wood fixing the deck. We did a number of mockups showing how Lance could be. Either full body, head and chest, with background or with a plan background. Jennifer opted to have him head and shoulders with an outdoors green background. This allows dus to really focus in on Lance and capture his featured beautifully. Nicholas painted Lance at 16 x 14 inches and traditionally hand painted him in oils on canvas. 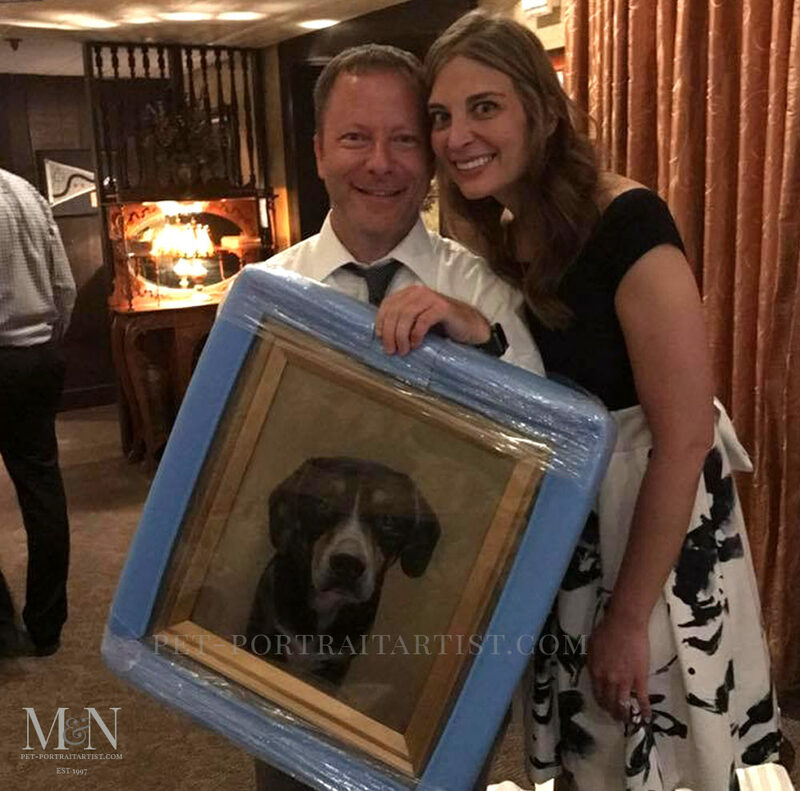 The portrait was then framed and headed off to USA in time for Jennifer to present the painting to Bob at their wedding rehearsal dinner. Jennifer very kindly sent us photo which you can see below, along with photos of the portrait frame and stages of the paintings process. 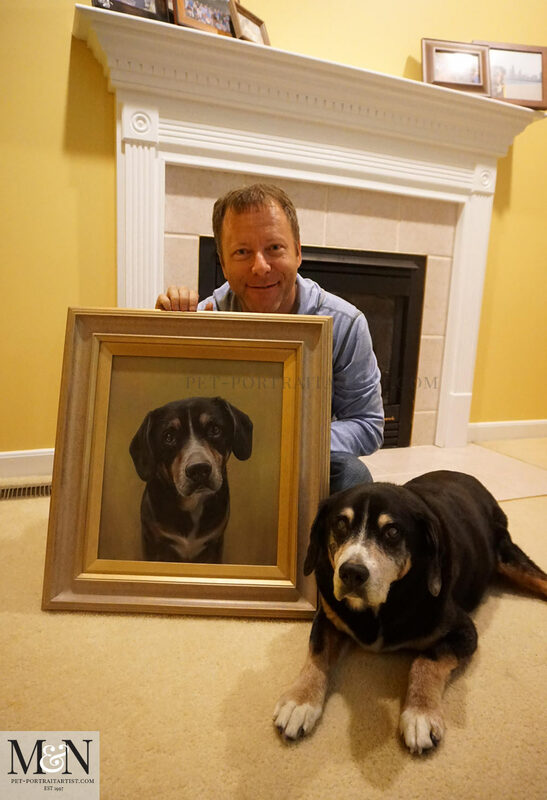 The first photo below is of Bob with his Entlebucher dog called Lance, along with the painting which Nicholas created for him. Jennifer commissioned Nicholas to paint Lance as a surprise gift. The portrait was to be presented to her fiancée Bob at the rehearsal dinner on the eve of their wedding and the surprise went really well. Jennifer emailed…. I just wanted to update you on Lance…it was a hit! I gave the portrait to Bob at our rehearsal dinner last Friday and to say the least, there were tears because he was so happy and emotional. Jennifer took a lovely photo of Bob and his dog Lance for our website which you can see below. We were delighted to receive the photo. It will be adorning our website when we create the updates on Lances page in the coming weeks. We would officially like to congratulate Jennifer and Bob on their recent wedding. The very best wishes for a long and happy life together! I just wanted to update you on Lance…it was a hit! I gave the portrait to Bob at our rehearsal dinner last Friday and to say the least, there were tears because he was so happy and emotional. Thank you so much for helping to make our big day special! I’ll send more pics when we put it up on display. Lance was framed buy our framers using one of our favourite mouldings – Westminster Frame. Looking at photos, the portrait and the frame will work so well with Jennifer’s home decor. Their room and fireplace is gorgeous! 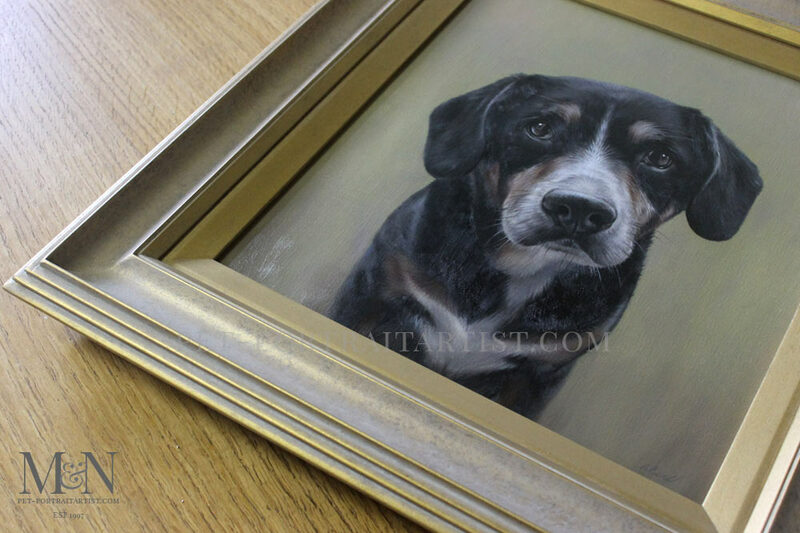 You can see the frame in more detail on our framing page on our website.